Oscar carries out his ministry in the city of Lima and in the jungle of Peru where he visits five different native communities periodically. 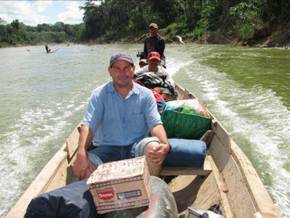 Oscar is part of Segadores, a Peruvian church planting group dedicated to reaching the tribes of the Amazon basin. He is currently also the President of Segadores. Oscar is part of the Segadores mission team and came to know the Saviour while living in the jungle. Bright Hope World has partnered with him since 2002. The beneficiaries of this partnership are the various unreached tribal groups living in the Peruvian Amazon. 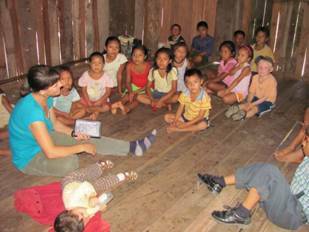 Amongst these groups there are tribes that are new to civilisation speaking a language that was previously unknown. There are a number of points Bright Hope World likes about this partnership, one of which is the fact that Oscar is involved with people groups who a number of years ago had no contact with civilisation. We are excited about the passion that Oscar and the other Segadores missionaries have for the unreached, which translates into tireless and selfless commitment to bringing the Gospel to these people. We also like the sensitivity and carefulness with which Oscar approaches the delicate task of bringing God’s life-changing message to these tribes. This is the case with all the Segadores missionaries. Oscar was born in Apurimac in 1965. He became a Christian in 1986 in a very critical situation of his life. He studied at Upper Room Pentecostal Bible Institute and was called to missions through the story of the calling of Paul in the book of Acts. In the past he has been the President of Segadores. Oscar is a passionate evangelist and discipler and is also involved in training tribal missionaries to reach to their own people. Oscar is married to a Christian Romanian woman, Aura, who shares his passion to reach the tribes of the Peruvian Amazon. They have two children, Briana and Filip. Oscar works closely with the rest of the Segadores team. 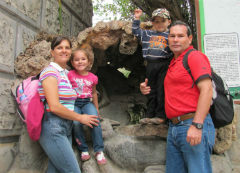 Oscar's vision is to reach unreached people groups living in Peru. The strategy is to systematically break down the barriers that exist with the tribes that he currently works with. This is accomplished via community projects like providing water, safety training in regards to health and awareness of dangers from terrorist and drug groups. Only when this kind of strategy is carried out will the opportunities arise to share the Gospel of Jesus Christ. This has already borne fruit through the work of Oscar and the rest of the Segadores team.